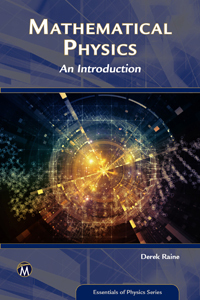 This book is designed as an introduction to the mathematical concepts used to describe fundamental physics principles. Numerous examples and applications enable the reader to master complex mathematical concepts needed to define topics such as relativity, mechanics, and electromagnetics. 1. Derivatives and Integrals. 2. Elementary Functions. 3. Functions, Limits and Series. 4. Vectors. 5. Matrices. 6. Differential Equations (1). 7. Complex Numbers. 8. Differential Equations (2). 9. Multiple Integrals. 10. Partial Derivatives. 11. Partial Differential Equations. 12. Fourier Series. 13. Introduction to Vector Calculus. App. A. Prerequisites. App. B. The Greek Alphabet. Index. Derek Raine (the lead author) is Director of the Centre for Interdisciplinary Science in the Department of Physics and Astronomy at the University of Leicester. His research has ranged over relativity, quantum field theory, astrophysics, and more recently, biophysics and complex systems. Contributing authors include the following: G. A. Wynn, S. Vaughan, M. Roy, R. O. Davies, and E. J. Bunce.